This recipe is for a jelly roll. I have one from my grandmother with similar instructions but with the measurements, which is very helpful! Again, the kitchen Maggie Ritchey was cooking for must have been quite different from even mid 20th century kitchens because she used weights rather than volume measurements. I have read recently that in baking especially, weights are more precise and so could possibly give a better outcome. I am not convinced, but I also think that as a home baker for my family and friends, the outcome is not as crucial as a head cook in the kitchen of a great house or restaurant. 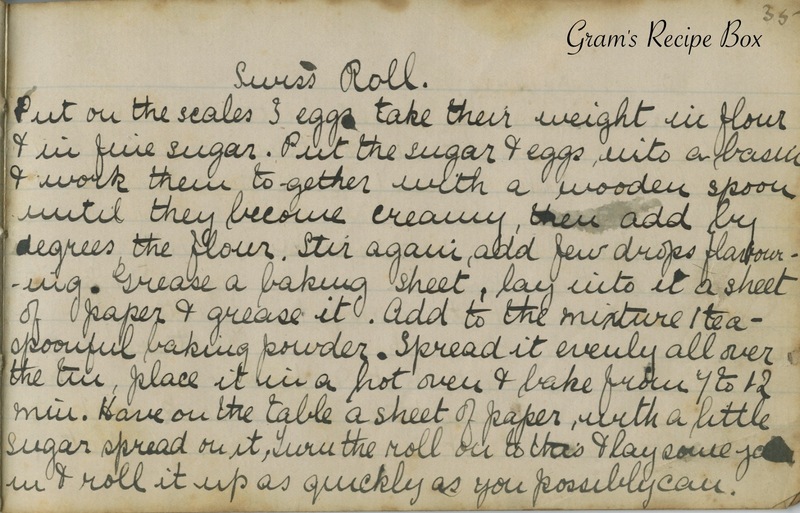 Below the transcription of Maggie’s recipe, for comparisons sake I will add the more modern jelly roll recipe. Gramma A says that Gram had an electric mixer pretty soon after they were available, so even if this recipe is from the 1930s the mixer could still have been used. The first electric hand mixer was available to homemakers in the 1910s. Who knew? Put on the scales 3 eggs take their weight in flour & in fine sugar. Put the sugar & eggs into a basin & work them to-gether with a wooden spoon until they become creamy, then add by degrees the flour. Stir again, add few drops flavouring. Grease a baking sheet, lay into it a sheet of paper & grease it. Add to the mixture 1 teaspoonful baking powder. Spread it evenly all over the tin, place it in a hot oven & bake from 7 to 12 min. Have on the table a sheet of paper with a little sugar spread on it, turn the roll on to this & lay some jam in & roll it up as quickly as you possibly can. Beat 4 eggs until very thick and light. Gradually add 3/4 cup sugar, beating all the while – add 1 teaspoon vanilla. Remove beaters and fold in flour mixture carefully. Just before putting into pan, add melted butter – don’t stir too well. Bake at 400 for 15-20 minutes. While baking lay out linen dish towel sprinkled with powdered sugar and get ready a jar of dark jelly by beating it with a fork. Turn out cake onto cloth – quickly make cuts along edge of cake so it will roll. Spread with jelly, roll up and wrap in cloth until it remains in shape. Jelly roll was one of my favorite deserts when I was a kid. I don’t recall making it even once in my 56 years of marriage – it seemed too work intensive, but it definitely delicious!